Property: Suitable for up to 4 bedrooms. â€‹â€‹The Ebac 3650 dehumidifier is their latest innovation to solve damp problems, condensation problems and mould problems in your home. 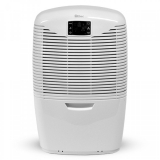 The Ebac 3650e dehumidifier is a powerful 18 litre dehumidifier that has patented Smart Control system. The Ebac smart control saves up to 30% of energy compared to other basic dehumidifiers. This makes the Ebac 3650e one of the lowest cost dehumidifiers to run. Operates effectively at low temperatures to 3Â°, essential for the British winter. Timed laundry Drying Mode (2/4/8 hrs). Water container capacity 2.5 Litres. Page processed in 31.07 milliseconds.This figure denotes the time taken by the server to process this page.